Hello, all. OK, I've gotten over my grumpiness and have decided to finally review this cake. In case you're wondering why I'm grumpy, it's because I ordered the Texas Pecan cake, not the fruitcake, from Eilenberger. 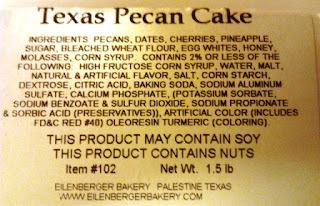 So what you're getting here is a review of a pecan cake, not a fruitcake. And that is exactly what I got. Very cute. 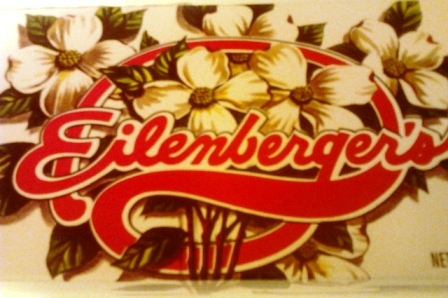 Here's a photo of the cake, done in the style that I can only call "MondoFruitcake Ugly:"
This picture implies that Eilenberger has been around awhile, and indeed they have been around since 1898, per their website. Their website also mentions that they are "the oldest bakery in Texas still operating in its original location." 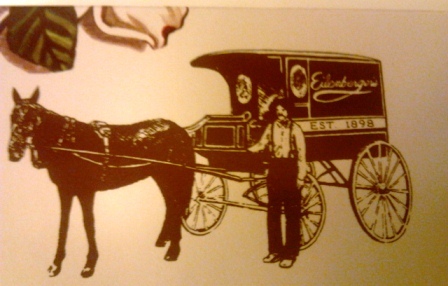 And that's saying something, considering all of the fruitcake companies based in Texas. I actually think it's really cute. 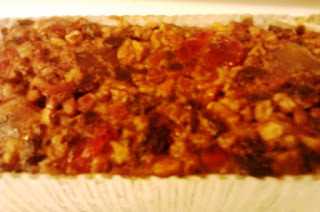 In my defense, most Southern style fruitcakes are very, very nutty. And there are some fruitcake makers nowadays who, in an effort to shirk the scourge of the fruitcake name, choose to call their fruitcakes something else. For example, I hope to be trying a sample of the Women Helping Other Women Cranberry Orange Walnut cake very soon. I contacted their customer service and asked "which cake is the most like a traditional fruitcake?" and that's what they told me. They don't actually have a cake called a "fruitcake," yet they have several cakes that contain fruit. Hey, I'm not judging; I can understand why they might do it. But enough excuses; let's get on to the cake. As you can see from the ingredients, there is a lot of icky stuff, but I will believe them when they say that it contains less than 2% icky, since most of those ingredients (except for the high fructose corn syrup) seems to be part of the candied fruit. There are some nice pieces of fruit in this cake, though not as much as a regular fruitcake. That could be an advantage to those who aren't super into the fruit in a fruitcake. This cake DEFINITELY has nuts in it--that nut being the pecan. I am a fool for a good pecan. It's my favorite nut. In texture this cake resembled some of the more candy-like southern cakes--barely enough "cake" to hold the ingredients together, and that "cake" was more like candy--very sweet and gooey in texture.This cake really accents the pecan, with a hint of some candied fruit, in an almost candy-like batter. What I don't like about this type cake is that I feel the batter holding the ingredients together has an uncooked quality to it and tastes a bit like raw dough. This would be a good cake to get if you a) really like nuts; b) like a very sweet, candy-like cake without a lot of cake in it, and c) like a fruitcake without so much fruit in it. Hmm, just re-read that last sentence. A non-fruity, non-cakey, non-fruitcake. Buy it if you like pecans.